Chocked full of fresh vegetables, this tasty colorful salad is the perfect side dish or meal. I love this tangy greek-style pasta salad because it is very easy to make and is the perfect side dish to bring to your next party or potluck. The flavors intensify if made a day ahead. Add chicken for a light refreshing meal. Cook orzo pasta according to package directions. Drain Pasta. In a large bowl, place the chopped tomatoes, cucumbers, and onions. Season with Cherchies® Garlic Seasoning. 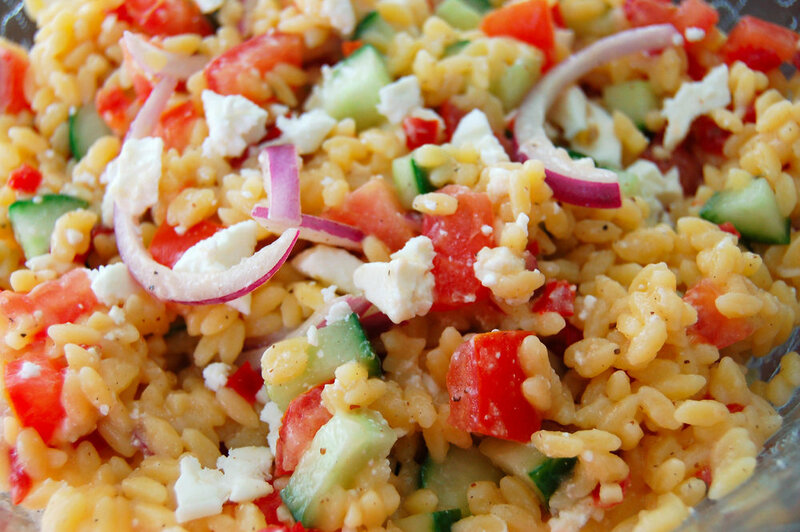 Add the drained orzo to the salad. Then add Cherchies® Pretty Peppers and lightly season with pepper. Right before serving, add the Lemon Honey Vinaigrette. Next add the Feta cheese and mix to combine. Add more dressing to taste. Serve immediately. (*The flavors intensify if made a day ahead). Tangy, refreshing Lemon Greek Salad. Enjoy!